Six-point Saturday is absolutely crucial to mapping out the rest of the season for the North East’s big two. Six-point Saturday is absolutely crucial to mapping out the rest of the season for the North East’s big two. Chief sports writer Mark Douglas sets the scene for a critical day. ON the south coast, they have sized us up. The Southern Daily Echo – the local newspaper that covers the zigzagging fortunes of Southampton – has pegged Newcastle and Sunderland as “winnable” games for their local club. United and the Black Cats are tagged in Hampshire as teams embroiled in a basement battle, along with their own club – who were among the favourites to go down when the first ball was kicked on a sun-kissed August afternoon. You would have been offered long odds back then that this would be a season of toil and potential relegation trouble for both of the North East’s big two. Sunderland had added two internationals after the biggest single day of spending in their history while Newcastle had managed to stave off Premier League predators to retain the nucleus of the side that finished fifth last year. Caution is always the name of the game on Wearside and Tyneside but it was underscored by optimism. Two fine managers with good squads, went the theory – what could go wrong? Nothing catastrophic has. Instead it has been death by a thousand cuts for both clubs, who have been beset by injuries and suspensions to key players while also seeing summer transfer gambles fail to pay off. Momentum, as Alan Pardew is fond of saying, has eluded both clubs all season. They have both secured crucial wins of late but neither has managed to build on that foundation, and every week sees confidence and composure ebbing away. Speaking of today’s opponents QPR, Pardew hit the nail on the head. “They've got some momentum and that's very important in the Premier League. It's something we've been searching for,” he said. “We had a little bit in the start of the season, but it got away from us and it's momentum that carries you through in this league.” Which brings us to ‘six-point Saturday’ – the point at which both clubs could alter the course of their campaigns. With QPR visiting Tyneside this afternoon and Sunderland on the road at fellow strugglers Southampton, there can be no underplaying the importance of these 90 minutes to the North East’s Premier League representatives. Three points for both would ease the pressure immensely, and provide a much more comfortable route into a tricky set of festive fixtures. Lose (or in Newcastle’s case fail to win), and it would only heighten the sense of anxiety ahead of a really difficult run for both teams. Between them they face the two Manchester clubs, the Merseyside duo and North London’s finest. They represent five of the Premier League’s top six and on current form, you are taking those teams on in hope more than expectation. Wins today would change the agenda completely. With the safety net of three points Newcastle and Sunderland might be able to enjoy taking a swing at the division’s heavyweights rather than approaching them with a ‘must-not-lose’ attitude. Having been there as recently as 2009, it is in no one’s interests for the North East to find itself at the centre of another Survival Sunday. And it is true to say that this doesn’t have the feel of a relegation season just yet. There are no schisms in the dressing room and it is clear that both managers still enjoy the backing of the boardroom and the terraces. Just take a look at the following that Sunderland are taking to Southampton today – a sold-out away end of 2,000 will roar on the Black Cats. Big numbers are expected at St James’ Park too. They arrive fully aware that their club’s immediate destiny could be defined by events today. Make no mistake, we are playing for high stakes this season. A £5.5billion television deal will make the Premier League one of the most lucrative leagues in the world next year and further increase the divide between the top-flight haves and the Football League have-nots. Slipping into the Championship might have been a restorative process for bruised Newcastle last time, but they do not want a return any time soon. Similarly, Sunderland are not complacent enough to talk of being “established” in the top flight – even if it might seem like it after five years at the top table. O’Neill knows as well as anyone that garnering points in the Premier League is a tough, tough business. Today offers the perfect chance for both clubs to get those “good results”. Southampton are dangerous on their own patch but brittle at the back. At full tilt, Sunderland will cause them problems. Similarly, QPR’s renaissance should not mask their obvious weaknesses. If Newcastle apply themselves as they did against Manchester City, it is difficult to see any other outcome than three much-needed black-and-white points. Then, we can start to look upwards again. 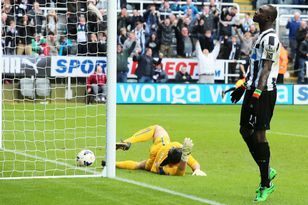 “Things can change so quickly,” Newcastle defender Mike Williamson told The Journal on Thursday. “Villa have had a few wins and have got up and out of it. You know, it's tight, you can get out of it very quickly just as it's easy to slip into it.